Fish Point on April 1, 2014. Photo by G. C. Gibson. PIBO’s 12th spring migration monitoring campaign got underway on April 1st under partially cloudy skies and with light winds from the south. 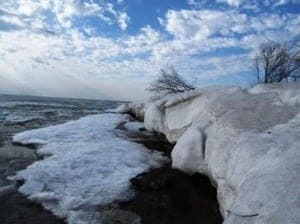 Although it was a mild eleven degrees, evidence of the winter weather was all around, with the lake mostly frozen and with large snow banks still covering the east and west shores. Despite the conditions, there was a surprisingly nice variety of birds around, with 43 species noted on the ninety-minute walk. Hundreds of waterfowl of fourteen species were recorded on the lake and at Fox Pond, along with lots of juncos, Tree and Song Sparrows, and ones-and-twos of Brown Creeper, Golden-crowned Kinglet, and a lone Tree Swallow. Over the following days it became clear that the late breakup of ice on the Great Lakes had a significant effect on typical March migrant waterfowl. Most years these birds have passed through the area by April 1st, but this year there were record numbers of Common Mergansers, Common Goldeneyes, and Hooded Mergansers, among others, that lingered throughout the first week of April. The wind shifted to the east on the 3rd and there was steady rain all morning, which made for a quiet time, although lots of Turkey Vultures were tallied on the day. A single Ruddy Duck on the west beach and a Ring-necked Duck at Fox Pond on April 4th were both new for the spring. More Red-breasted Mergansers started to arrive after the 5th, with 500 birds spotted on the 7th, along with spring ‘firsts’ for Ruby-crowned Kinglet and Chipping Sparrow. A Pied-billed Grebe and some Horned Grebes on April 8th were new for the spring and it was quite active for songbirds as well, with 27 Golden-crowned Kinglets and smaller numbers of creepers, Winter Wrens, and Hermit Thrushes observed at Fox Pond. The 9th was generally quiet apart from a couple of lingering Tundra Swans, 10 Eastern Phoebes, and a few Yellow-rumped Warblers. New arrivals on April 10th and 11th included Caspian Tern and Blue-gray Gnatcatcher. Up to 750 Bonaparte’s Gulls were recorded on April 12th along with 600 Red-breasted Mergansers and hundreds of blackbirds. An early Chimney Swift was observed coming in off the lake on the 13th and five sparrow species were tallied along the west beach. Strong northwest winds and minus two centigrade at dawn on the final day of the summary period made for a somewhat low-key morning, although a few new arrivals included singing Pine and Black-throated Green Warblers, both new for 2014.